On this day in 1894, a short article entitled “How a Jew Found Truth” in the Catholic Herald, a popular English Catholic newspaper, argued that there was some merit to the claim that the Jews deliberately remove and obliterate passages from their own Hebrew scriptures in order to hide the truth of Christianity. 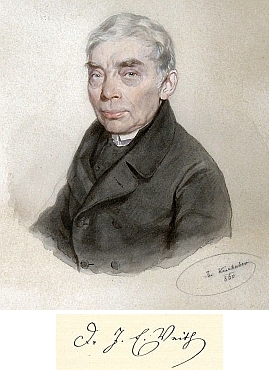 According to the article, Johann Emanuel Veith (1787-1876; a Jewish convert to Catholicism, director of the school of veterinary medicine at the University of Vienna, and a prominent and popular priest and preacher), used to have passages read to him as a youth from the Old Testament by his father. The Catholic Herald explained that from a young age he had studied his father’s sacred books assiduously, and by the time he was sent to Prague to study philosophy, he already “knew the Scriptures of the Old Testament thoroughly.” According to the article, though Jewish, Johann Veith decided to attend some Catholic religious classes, and he was astounded to discover passages from the Old Testament “concerning the Messiah which he had never read or heard of at home.” The Catholic Herald explained that when he next visited his father, he examined “his father’s old Bible” to check the passages he had discovered at the Catholic religious classes that discussed the messiah, and found that “the pages containing these quotations had been destroyed or glued together or obliterated.” According to the Catholic Herald, when he asked his father for an explanation, the only answer he received was “a severe blow on the side of the face.” It was that blow, the paper explained, that steeled him to study Christian theology, leading him to “the truth of Christianity and of the Catholic Church.” See “How a Jew Found Truth,” Catholic Herald, 23 March 1894. This story in the Catholic Herald was a modern example of an oft-repeated anti-Jewish claim dating back to antiquity and frequently repeated during the Middle Ages. As Joshua Trachtenberg’s important study of the religious diabolisation of Jews notes, there have been Christians, from antiquity to the modern day, who have believed that the Jews were wilfully malicious and insincere rather than ignorant in their rejection of Christ. For example, some of the early Church Fathers, such as Jerome and Justinian, complained that the rabbis “consciously and deliberately perverted the meaning of the original text.” Medieval scholars even accused Jews of “tampering with the text of the Bible in an effort to destroy its Christological meaning.” See Joshua Trachtenberg, The Devil and the Jews: The Medieval Conception of the Jew and its Relation to Modern Antisemitism (Philadelphia: Jewish Publication Society of America, 1943), 15, 153. One may ask, did Veith really make the claims suggested by the Catholic Herald about his father’s alleged tampering with the Bible? It is difficult to conclusively answer this question. There is anecdotal evidence upon which one may speculate, but this may lead the interpreter to either conclusion. In Veith’s favour, it seems likely that he did publicly refute another malicious anti-Jewish myth, the blood libel. According to Hermann Stack’s classic study of the ritual murder accusation, there are at least three written testimonies to the effect that Veith had publicly stated, at the end of a sermon delivered in Vienna in May 1840 (i.e. shortly after the infamous Damascus blood libel), that there was not a single word of truth in the ritual murder accusation against the Jews. These testimonies were provided by Professor Franz Joseph Molitor (a German Christian Cabalist, and scholar of Hebrew, the Talmud and the Zohar), Dr Eduard Kafka (an Austrian author), and Veith’s brother, Joseph Veith. According to Strack, the concluding words of the sermon were later printed in a Viennese newspaper, the Illustriertes Wiener Extrablatt (on 5 June 1882), though as this was four decades after the sermon was delivered, their accuracy is difficult to check: “I swear here, in the name of the triune God, whom we all acknowledge, before you and all the world, that the falsehood which has been disseminated by cruel cunning, to the effect that the Jews use the blood of a Christian in the celebration of their [Pesach] festival, is a malicious, blasphemous slander, and is contained neither in the books of the Old Testament, nor in the writings of the Talmud, which I know thoroughly and have zealously examined.” Veith’s rejection of the blood libel accusation was also mentioned, albeit in passing, in the 1906 Jewish Encyclopedia. See Hermann L. Strack, The Jew and Human Sacrifice, 8th edition (New York: Bloch Publishing, ), 245-248. See also “Blood Accusation,” The Jewish Encyclopedia, vol. 3 (New York: Funk and Wagnalls, 1902), 266. Whilst the explicit and public rejection of one anti-Jewish myth might seem to suggest that it was unlikely that he would endorse another, its evidential basis for determining whether Veith did make the claim reported in the Catholic Herald is at best anecdotal. Furthermore, it seems that there is similar, perhaps stronger, anecdotal evidence suggesting that he might have made the claim. Significantly, it seems to be true that Veith held little love for his father, and spoke of Judaism with bitterness. According to a biography of Veith written by Johann Heinrich Löwe (Veith’s nephew), Veith’s father had the habit of setting him tests every few weeks, and when he failed those tests, he was locked in a small room without food. Veith rejected his father’s wish that he study to become a rabbi, and later wrote (in 1866) that he hated his home Czech town of Klattau, as it was there that he lived a “neglected, mishandled, and joyless childhood, troubled by atrocious examples.” He complained that he “did not even learn Czech, which would have been a thousand times better than the rotten Talmud.” On another occasion, Veith stated that he had been called “from the dung heap to Christianity.” See Johann Heinrich Löwe, Eine Biographie (Vienna, 1879), cited by Adam Bunnell, Before Infallibility: Liberal Catholicism in Biedermeier Vienna (London and Toronto: Associated University Presses, 1990), 60-65. There are also grounds for believing that if Veith did protest against the blood libel in 1840, he later came to change his mind. In 1854 and again in 1856, a Catholic newspaper, the Wiener Kirchenzeitung, published a declaration, allegedly at Veith’s instigation, to the effect that he regarded the whole story of his having declared that the blood libel was a myth as a “contemptible slander.” Strack rejected this, noting that the language of the article in the Wiener Kirchenzeitung was that of Sebastian Brunner. An Austrian priest, author and newspaper editor, Brunner was obsessed with the so-called Jewish threat to Christian civilisation. Strack is probably right that the language was Brunner’s, but as Brunner was both the editor of the Wiener Kirchenzeitung and a close friend and associate of Veith’s, this would only seem to suggest that Brunner wrote the piece on his friend’s behalf, or influenced his language. As far as I am aware, there is nothing to indicate that Veith ever rejected the statements in the Wiener Kirchenzeitung. See Strack, The Jew and Human Sacrifice, 245-246. The account of Veith discovering that his father destroyed, glued together and obliterated pages from the sacred text to hide passages alluding to Jesus is highly implausible. Jews read the Tanakh, and Christians read the Old Testament, in very different ways, and as such, non-Christian Jews do not tend to hold that passages in the Tanakh/Old Testament refer to Jesus. Those Jews who believe that the arrival of Jesus was prophesised in the Old Testament are of course likely to embrace, or already have embraced, Christianity. By depicting the Jews as recognising passages in the Tanakh as prophetic references to Jesus, and then wilfully responding by desecrating the relevant scriptural passages by obliteration or gluing together of pages, is to construct an image of Jews as highly malignant creatures. However, Veith was capable of speaking with acerbic sarcasm and bitterness when it came to his political and religious opponents, and when it came to his father, it may well be that he felt he had fair reason to be bitter. Certainly it seems that his personal experiences of being instructed in Judaism were not happy ones. It is thus plausible (though it has proven impossible to verify) that Veith, drawing upon a popular medieval myth, did narrate the rather fantastic story depicted in the Catholic Herald, perhaps as an instance of angry hyperbole. Certainly Veith often spoke badly of his Jewish heritage, and quite probably criticized and challenged his father’s readings of the Tanakh.